Maple Syrup is a 100% natural and organic product. Maple Syrup contains as much calcium as whole milk. Maple Syrup has only 40 calories per tablespoon, while corn syrup has 60. 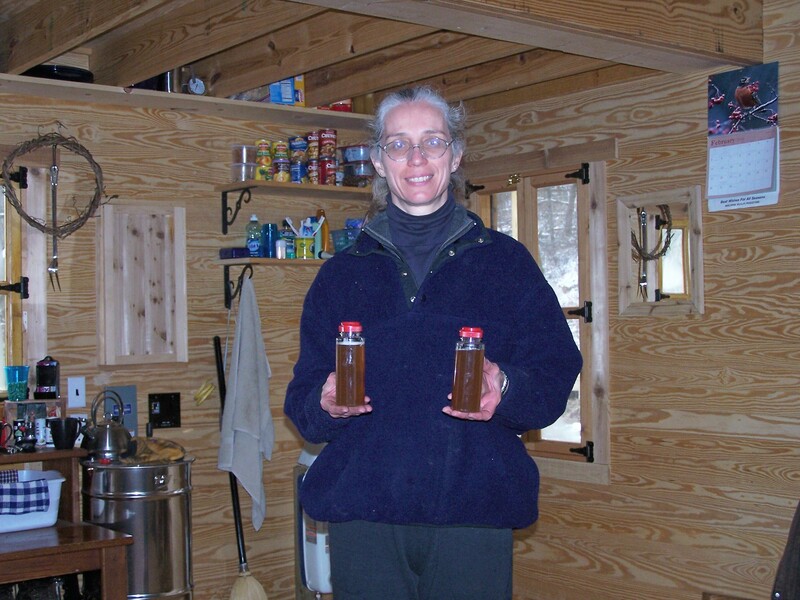 Maple Syrup is rich in minerals such as calcium, potassium, manganese, phosphorus, and iron. Maple Syrup contains vitamins B2, B5, B6 and niacin as well as folic acid. Maple Syrup even contains trace amounts amino acids, the basis of protein. were smooth, not serrated. I was going to be in business! 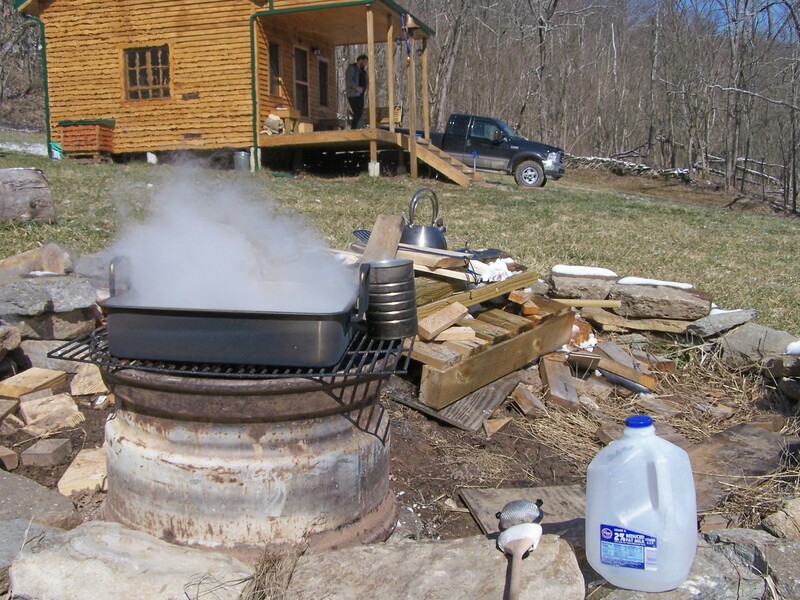 The maple sugarin’ business that is. Emery’s Sugar Tree article in the ninth edition of her book, The Encyclopedia of County Living. on February 14th, Valentine’s Day, 2006, I tapped my first tree. of the spout’s tip at a steady drip, drip, drip. I was thrilled! jug. It was as though we had turned on a spigot. 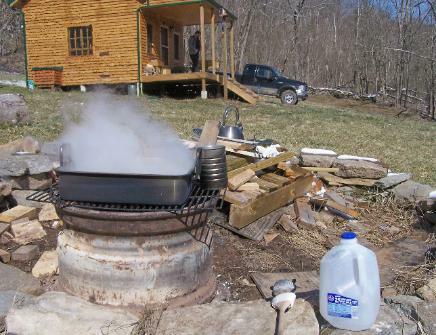 gallons of clear maple sap. It tasted like mildly sweetened water. As soon as each jug was full, I taped up the hose hole, and placed it into my kitchen refrigerator. 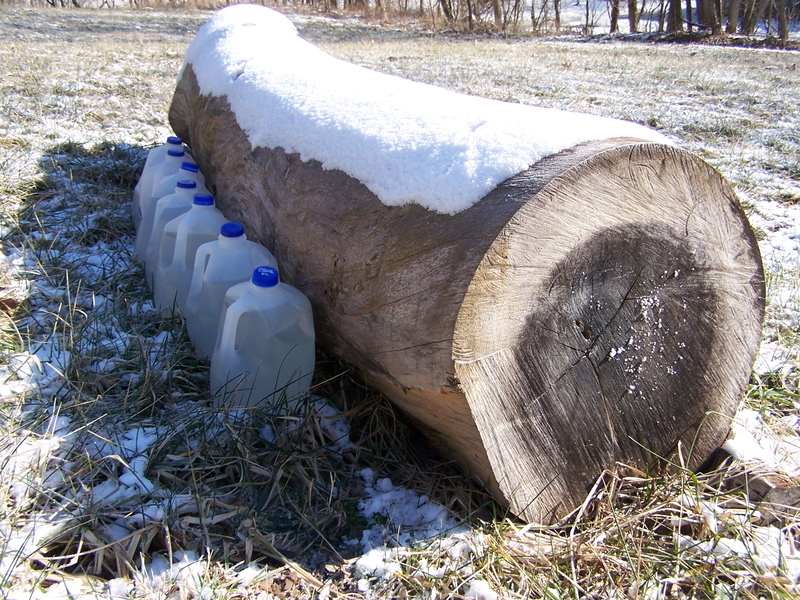 seven gallons of sap. I was ready to try to cook down my first batch. barometric pressure. 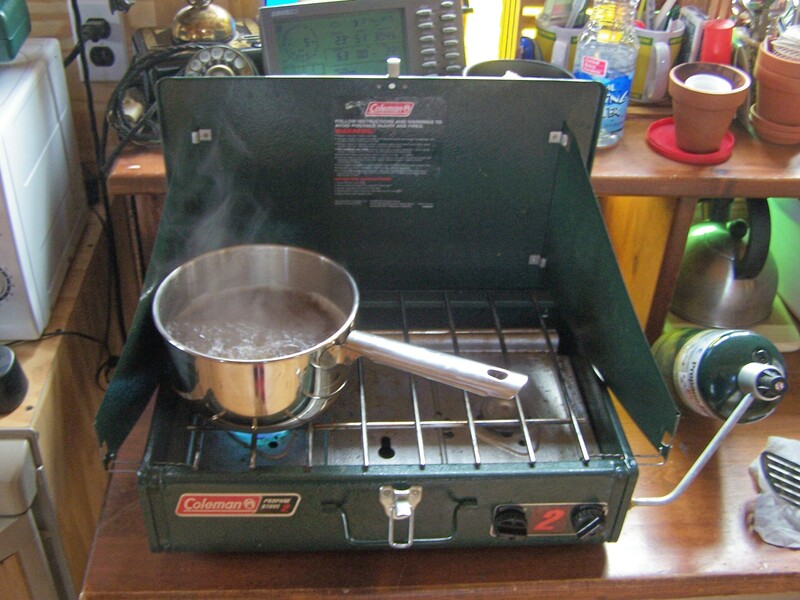 I let the temperature of my syrup rise to a temperature of 220 degrees. have to start cooking up an occasional pancake breakfast! From this ... To this!!! 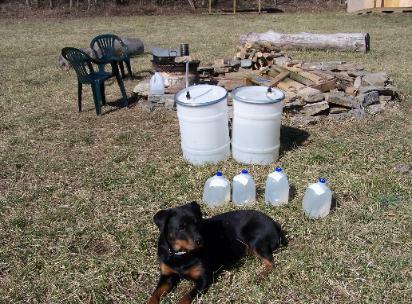 Ripley and the second batch of sap. Note the two fifteen gallon canisters. gallon jugs of sap. Then we woke up early on Sunday morning and headed back out to the creek. that one third filled canister over to the truck. We then moved on to check the second tree. lugging fifteen gallons of sap through the woods when we're in our nineties. 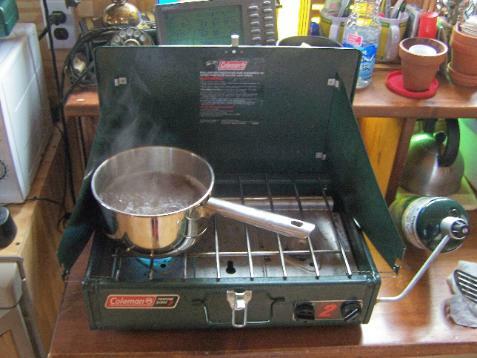 evaporating, thus never breaking the boil and not loosing time in getting the sap to return to a boil. Greg's sap flow regulator in operation. 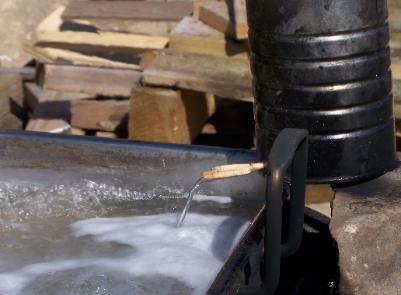 and boiling down sap until the sap stopped flowing. 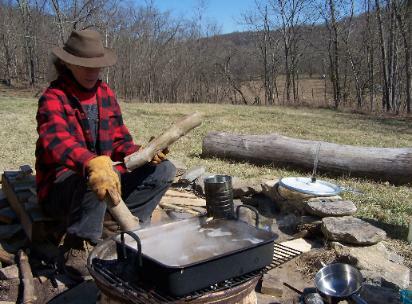 Christine puts two more sycamore logs on the fire. condensed sap in the lasagna pan. Another beautiful day at Straight Creek!